The Campaign For Owners was launched in 2012 after the shock removal of VAT relief for approved works to listed buildings. We immediately realised that if we wanted to see action taken we had to take it ourselves. Over the past seven years we have worked tirelessly to lobby all parts of government both on VAT and the wider issues affecting listed building owners. In 2019 we are ramping up our campaigning efforts, aiming to lobby every council in the UK regarding planning and building grassroots support for reforms. At the same time we will work in Westminster, in Holyrood and in the Senedd to ensure our members concerns are on the agenda at a national level. Listed buildings are controlled by the government and so the decisions made about them are political. A political campaign is the only way that we can have a voice in the legislation and regulations that affects us on a daily basis. Our Campaign for Owners was created in response to the removal of VAT relief, without any consultation of owners and using reasoning that anyone familiar with listed buildings could see was wrong. We are dedicated to ensuring that this doesn’t happen again, and that in future listed building owners will be the core stakeholder in all debates that affect our buildings. There are over 1.5 million people in the UK who are directly affected by listed building regulation, a huge constituency that presently has little direct influence on the laws made to govern them and their buildings. The Listed Property Owners Club is the only organisation in the UK who are representing the needs of owners and bringing them together as a political force. After significant lobbying, the club successfully spurred the creation of the All-Party Parliamentary Goup on Listed Properties, and presently act as the secretariat of the group. This is a forum where the club can take our concerns directly to members of parliament and ask for action. Over the past two years we have had a fruitful relationship with the APPG and its members, resulting in club members giving evidence to parliament and the housing minister approaching the APPG chairman, Craig Mackinley, to discuss VAT. As a club member you get to have direct input into the campaign and our work in Westminster, as well as the chance to be invited to give evidence or attend our events held in parliament. Engaging with the club and the APPG will ensure that your concerns and experiences will be taken into account. Local policies can have as much impact on listed building owners as those made in Westminster. Issues like the resources available for planning applications, local development plans and even the priorities of planning committees can affect you, but few local politicians ever discuss listed buildings. We want to ensure that every council in the UK has listed buildings on their agenda, and that they are making policies that improve the lives of owners. The devolved parliaments in the UK also have the power to make legislation effecting listed buildings within Scotland and Wales. Both the Scottish Parliament and Welsh Assembly have actively considered listed buildings recently, so they are open to discussing these issues. Lobbying them directly is a priority for our campaign both to help our Scottish and Welsh members, as well as to prove that our policies are positive and practical. Our campaign is a grassroots movement that depends on its members. We need all our members to get involved in our efforts by writing letters, attending meetings and creating groups in their local area. This will force politicians at all levels to take listed property owners seriously and have a position on our issues. There are over 1.5 million people who are directly affected by listed buildings, a huge group of voters that is presently not being represented. The club is the only organisation that is campaigning for owners and giving you a voice. The first step towards creating change is getting involved and spreading the word. Just taking simple steps to reach out to friends and family members about the issues that affect you will have an impact and bring more people to our cause. We hope to see all our members joining with the club and working to build our campaign into a national force that demands attention from Westminster. The campaign has now reached a seven-year milestone, and during those years, we have been tirelessly lobbying MPs and Ministers for changes to benefit you as listed building owners. Listed buildings face a wide range of challenges, including both legislative inaction and regulatory issues. Get more information about the issues our campaign is focused on, and read our latest policy documents. We encourage all our members to campaign to their local representatives on the issues that matter to them. We have produced a range of resources to help you lobby your council or MP. Click here to find out more on the latest news and updates for LPOC’s political campaign for owners, and have your say in our comments. The shock removal of the VAT exemption on listed building alterations in 2012 has had a huge impact on owners. The increase in costs led to an immediate drop in the number of owners carrying out works to their property. We aim to reduce VAT to 5% on repair, maintenance and approved alterations to make owning a listed building more affordable and ensure they are preserved for years to come. The present listed building consent process comes with long delays and high costs. It can take months to gain consent and often only after spending a significant sum to produce the supporting documents required. We are lobbying for a streamlined system that would be more proportional to the works being undertaken, and as a result would reduce red tape and improve efficiency. Local councils have faced major reductions in resources in the past decade which has hurt their ability to deliver a quality planning service. This has had a huge impact on listed building owners, who need to work with their local planning authority more often than any other type of property owner. We are campaigning for improved council funding, and ring-fenced resources for conservation officers and planning services. The present listing system leaves many buildings in legal limbo, with no clear answer if they are protected or not. This can have a major impact on owners, often forcing them to assume all outbuildings and structures are listed and incurring significant costs to maintain and alter them. We are campaigning for enhanced listing to become cheaper and more widely available, providing owners with more certainty. Over the past decade planning authorities have become increasingly stringent in their requests for wildlife surveys, particularly for listed buildings. This is a result of unclear legal guidance that leads councils to be overly cautious in their interpretation. We are asking for improved guidance to be issued to clarify where surveys are needed. Unauthorised alterations made by previous owners are a major worry for all listed building owners. They can present a very major financial challenge when they are discovered no matter when they were made. We are campaigning for common sense reforms that would protect owners from being held responsible for previous unauthorised works. Have you been struggling with any of these issues? Contact the club on 01795 844939 for advice and support. You can share your story here, which helps us build evidence for change and put pressure on government. The All-Party Parliamentary Group (APPG) on Listed Properties was created after tireless campaigning by the Club. Realising we needed a strong voice in Parliament speaking up for listed property owners we worked with sympathetic MPs from all parties to help establish the Group. Craig Mackinlay, the MP for South Thanet chairs the Group. The APPG’s mission is speak up for listed properties in the UK and raise awareness in Parliament of the role played by their owners in protecting the nation’s heritage; to advocate policies that support owners in preserving listed properties including tax and planning reform. Now the Club acts as its Secretariat, providing the MPs with evidence of the challenges of owning a listed property, organising meetings and opportunities for owners to meet MPs and Ministers and put the case for reform. A recent highlight was a meeting with Heritage Minister Michael Ellis during which members outlined the costs and concerns created by the planning postcode lottery. 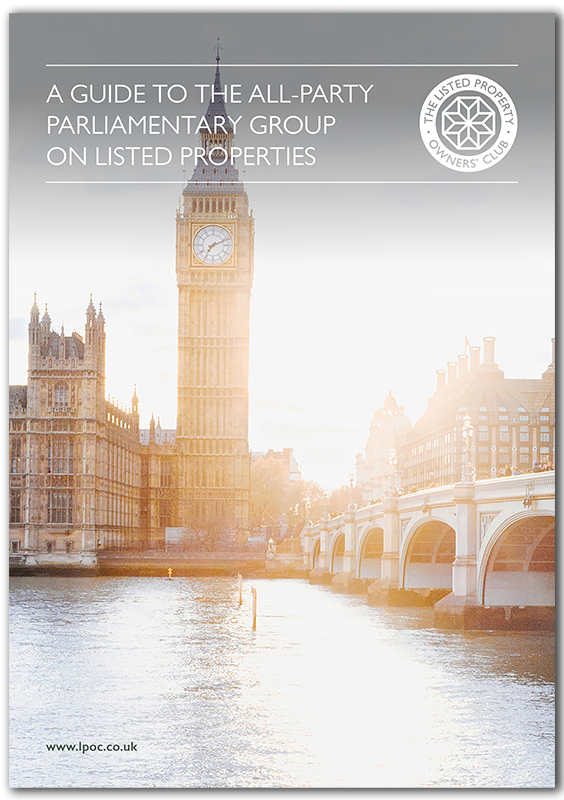 To request a printed copy of the Guide to The All-Party Parliamentary Group on Listed Properties, please call 01795 844939. Download the Guide to the APPG on Listed Properties here. I am delighted that the All-Party Parliamentary Group (APPG) is working with LPOC in campaigning for vital reforms that will help listed property owners. The APPG on Listed Properties has already won strong support from across all parties and it will provide a powerful voice in Parliament, raising the challenges listed property owners face and pressing for necessary reforms. Listed buildings in Wales and Scotland face a slightly different control scheme than in England. There are many similarities, but new laws affecting listed buildings are now made in Holyrood and Cardiff. Over the past decade the laws have diverged somewhat as the devolved parliaments have legislated. Despite these changes, there have not been any major reforms to the issues that affect listed building owners such as consent law, planning resources and pre-application paperwork. Now that powers over these issues are devolved to their respective parliaments each government needs to be lobbied separately to create truly national change. We firmly believe that this works in our favour; increasing the number of lawmakers that we can approach. Our campaigns in Wales and Scotland are particularly important because their parliaments are more approachable, which gives our campaign a far greater chance of success. Obviously this would deliver immediate benefits for our members in Wales and Scotland, but it will also serve as proof that our policies are workable and deliver the benefits we propose. Wales and Scotland will be key battlegrounds for listed building owners in the coming years, both for the 200,000 owners who live there, and for the wider community of owners in the UK. Wales and Scotland each contain thousands of listed buildings. Wales has over 40,000 while Scotland has more than 100,000. This places more than 300,000 owners under the auspices of the Welsh Assembly and Scottish Parliament; a huge number of people who are being ignored. Much of Scotland and Wales are also rural areas, with only a few historic cities like Edinburgh containing large numbers of listed buildings in an urban setting. This naturally means that these buildings and owners are spread across a large number of councils and elected representatives, which works to keep listed buildings off the political radar. Success in Wales or Scotland would be a huge achievement for listed building owners, helping to improve conditions and reduce costs for a quarter of all owners without needing to approach Westminster. Our first goal in Wales and Scotland is to campaign for the formation of a Cross Party Group. Cross Party Groups share many similarities with All Party Parliamentary Groups but within the Scottish Parliament and Welsh Assembly. They are groups of AMs and MSPs from across all parties to discuss a specific issue. They can form a venue for discussion, a channel of communication or a catalyst for change. We are actively campaigning for CPGs to be formed in Wales and Scotland, as sister groups to the APPG. As issues like planning are now administered by the national assemblies, they are just as important for us to approach. CPGs would provide a perfect opportunity to discuss policy ideas with law makers and ensure that listed buildings are not left off the agenda. HOW DO LOCAL GROUPS HELP? Local groups are a central part of any campaign. Our members are spread across the whole UK which is a key strength, allowing us to reach many more councillors and MPs, but we need to marshal our supporters together and present a unified front. We encourage all our members to start a local group. Sharing the challenges you face, as well as coordinating efforts when you approach your local council or MP can make a huge difference. The Club is happy to support all our members in forming groups, offering our advice and expertise as well as our national scale. Register your interest and join our campaign today. To be successful our campaign needs to reach as many people as possible, particularly the elected officials who can make a real difference on the issues that affect us as listed building owners. We need your help to spread our message, to tell us what issues matter to you, and to build evidence of the challenges you face. Writing to your MP, MSP, AM or council gives you an opportunity to tell them what matters to you. Your letters bring attention to listed buildings, and that our issues are on the political agenda. Taking the time to write shows your representatives that listed buildings matter to you. Read our letter writing guide. The Club is the only organisation that represents the community of listed building owners. The more members we have the bigger the influence that we have when meeting with MPs and ministers, so recommend your friends and neighbours to us. Every member makes a difference. Click here to join the club and show your support, or call us on 01795 844939. A local group can bring together listed building owners with family, friends and the general public to boost our message and show how important listed buildings are to our communities. Even small groups can have a huge impact on a local level by writing letters and attending meetings. Working together helps our message to spread and shows a united front. Consider moving your home insurance to the Club’s providers. They will pass a fee back to us and it is this fee that helps fund our campaign. Call 01795 844939 to speak to the insurance team. The personal impact of policies can be lost behind a wall of statistics, so we want to hear about your experiences as a listed building owner. Sharing your story helps us to personalise the issues when we speak with MPs and illustrate how their policies are effecting real people. Share your stories here or email us at campaign@lpoc.co.uk. The longer that we keep campaigning the more support we build, the greater pressure we can exert and the more fronts we can work on. You can be kept up to date with all of the developments from our Political Campaign for Owners when you sign up to receive our newsletter. Click here to sign up today.